My "Nebula Force Feedback hit table" files. Replaced the previous "grey scale" loading background with a colored one. 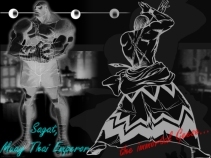 Replaced the Geese and Sagat gui pictures with better one (I think). Changed the gui texture and the color background. Fixed the previous "transparent quit button" bug. Click HERE to download it ! 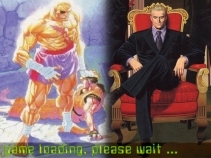 ... featuring the first bosses ever created by Capcom and SNK: the Street Fighter boss, SAGAT - the emperor of Muay Thai - and the Fatal Fury boss, GEESE HOWARD - the immortal - . Click HERE to download it ! NeoGeo Cheat Database for MAME By Mac LAK: This cheat database is intended to work with MAME *only*, and its clones. No particular bios is needed. 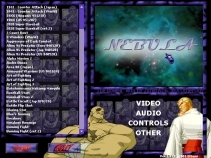 ADE_the_Jurist's Neo-Genie cheat list: list of NEO-GEO cheat to be used with Neorage and Neo Geo Game Genie bios by KiWi_SLT. Beware, the Neorage X windows emulator is not fully compatible with KiWi_SLT bios; only the old neorage DOS version has no problem, but there is no sound emulation in it. 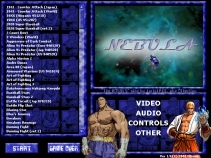 Neo Geo Game Genie 0.46 by KiWi_SLT: you need this bios, to use my cheat list.